Glow In Dark Keyboard Stickers | OhGizmo! 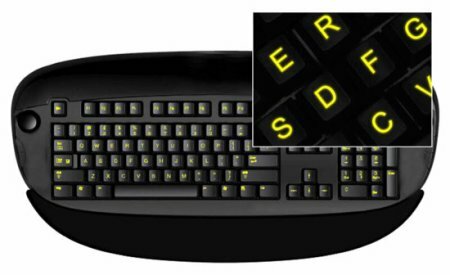 Backlit keyboards have become rather popular over the years, especially with gamers. Why? Because we tend to sit in the dark and game until the sun comes up. Sure, we know how to type without looking at our keyboards, but sometimes after grabbing a drink, we need to be able to quickly see where a specific key is without first finding home row. Oh, and it just looks awesome. Well fancy keyboards such as these can be rather expensive, so someone crafted a way to make the keys glow on any old keyboard. Glow in Dark Keyboard Stickers are the perfect solution. Of course by “perfect solution” I mean “worst idea ever.” Take a look at your current keyboard, with careful detail to your home row keys. If you’ve had it for a while, you’ll probably notice that either the letters have started to wear off a bit, or there is at least some visible signs that your fingers spend a good bit of time resting there. Now imagine if you put stickers on those keys. How long do you think they’d last? Oh, and don’t forget the tedious task of putting them all on straight. Even at $9, I’d rather have a plain boring keyboard than one with glow-in-the-dark stickers. Since I don't rest my fingers on the keyboard i think this is a great idea! Furthermore I've noticed over time that women are the ones that typically cause the letters to disappear. Something having to do with their natural body chemicals and pH level. That said, I'd speculate that you have woman hands. If I had woman hands I sure as heck wouldnt waste them on a keyboard. Can anything really be more tedious than gold farming in WOW? Dude, I can see your deadpan face. LOLOL!!!!! try putting a clear coat over the keyboard after you apply the stickers. That way it reduces wear and makes the keyboard easier to clean.